The England head coach was reportedly abused by Scotland fans after their Six Nations clash last year. 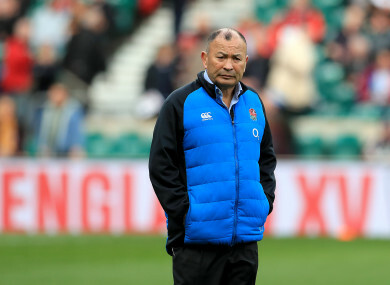 Eddie Jones ahead of England's Six Nations clash with Italy at Twickenham. ENGLAND COACH EDDIE Jones looked forward to settling a score against Scotland after his side maintained their Six Nations title hopes with a 57-14 thrashing of Italy at Twickenham on Saturday. Wales will be crowned champions if they end the tournament by completing a Grand Slam against Ireland in Cardiff before England kick-off against Scotland at Twickenham on March 16. But if the Welsh stumble then England, who ran in eight tries against Italy, could yet take the title by regaining the Calcutta Cup. Scotland, who lost 18-11 at home to Wales earlier on Saturday, beat England 25-13 at Murrayfield last season. The next day Jones was abused and attacked by Scotland fans at a train station in Manchester. Jones made clear at the time how he felt pre-match comments from Gavin Hastings — the former Scotland captain said the Scots would love nothing more than “to rub Eddie Jones’ face in the dirt” — had contributed to the incident. “We’ll rip into training and be at our absolute best next week, because we’re going to have to be to beat Scotland,” Jones said. For all Scotland lifted the Calcutta Cup last season, the fact remains they’ve enjoyed just four triumphs Twickenham triumphs over England — and the last of those was in 1983. On Saturday, Manu Tuilagi and Brad Shields scored two tries apiece as England ran riot against an Italy side who’ve now lost a record 21 successive Six Nations games. Jamie George, Jonny May, George Kruis and Dan Robson also crossed Italy’s line as England returned to winning ways following their 21-13 defeat by Wales in Cardiff two weeks ago. That loss led to suggestions Jones had been ‘out-coached’ by Wales boss Warren Gatland, particularly in his use of replacement players. Jones agreed, saying after the Italy rout: “I don’t think I coached the side very well against Wales and I take responsibility for that. Italy coach Conor O’Shea insisted the Azzurri could yet beat France in Rome next week despite this heavy loss. “Sometimes you can over analyse things. We were overpowered. And they (England) are an unbelievably powerful side,” he said. “They were a hurting side. But they’re the best side in the Six Nations, in my opinion,” the former Ireland full-back added. Italy captain Sergio Parisse added he was “pretty confident” of being fit for what could be his last appearance in the Six Nations after the veteran No 8 suffered a hamstring injury on Saturday. Email “'We saw how they carried on last year after they beat us' - Jones eyeing revenge against Scotland”. Feedback on “'We saw how they carried on last year after they beat us' - Jones eyeing revenge against Scotland”.